BAT jumped more than 15% today to near a market cap of $250 million on trading volumes of $12 million. The token has gained both against bitcoin and eth some 17% as bullishness returns following their launch of the Chrome based new Brave browser. 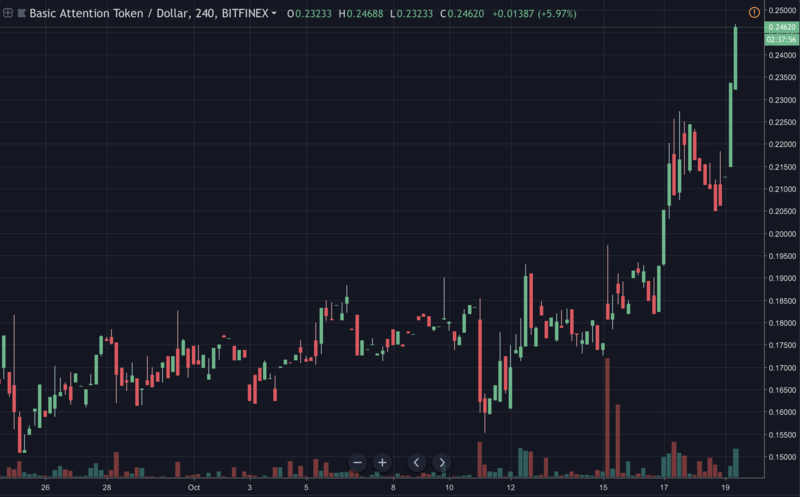 Bat’s recent price action, October 2018. We naturally tried it, and the first impression is that the new browser looks way cooler than the old one. It’s slick, unassuming, takes little space, and generally lets you get on with browsing. It is fast too, 22% faster than the older browser Brave says. Chrome based Brave Browser, October 2018. For those that use Chrome, there’s no reason to not switch. You get all the extensions of Chrome and really on the surface this is basically Chrome. But better. It doesn’t auto log you in, it has an inbuilt adblocker, it doesn’t have all the phoning home Google stuff, it does have Tor browsing on a tab, and of course you get some Bat. 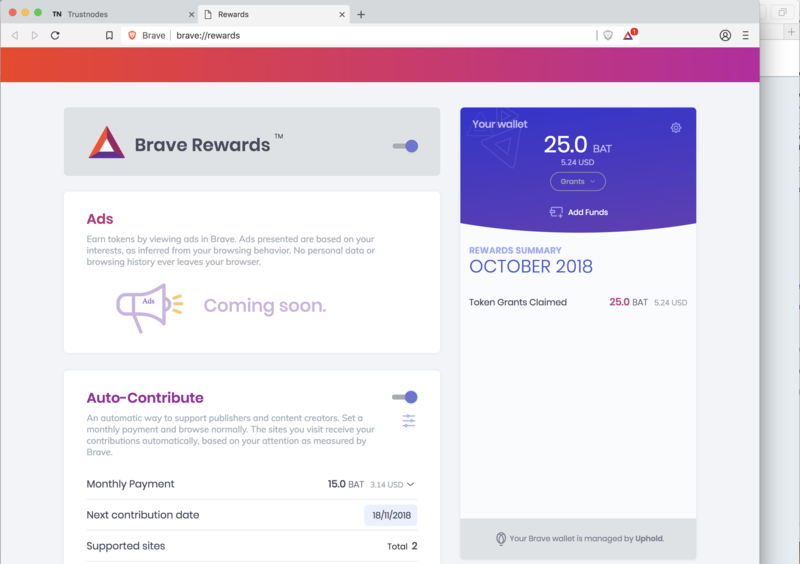 We already have Brave for the MetaMask plugin because that’s not available on Safari. The new browser, however, seems to be a new browser rather than an upgrade. So they told us we can have some BATs, which we naturally claimed. That’s part of their plan to bootstrap a token economy. They’re giving away hundreds of millions of BATs to anyone who downloads the browser. Ours will expire in 2019 if we don’t use them, with no withdrawal function as these are meant to reward the websites you visit the most. Eventually you’ll be able to earn BAT by opting-into ads, with the earned BAT then going to the sites you visit. That’s still being piloted, but it should be out soonish. So will we switch? We’re more tempted than before and if we were a Chrome user, probably. We don’t like any distraction on our browser though, save for the site content itself. So all those red notifications right at the top on the navigation bar should be customizably hidden where no one sees them because we don’t care what the little “bot” is doing, with our time far short for humans let alone notifying bots. Beyond zero distraction by the browser, we’d miss the reader function but it took us about two seconds to find a reader extension. That’s because with Brave now you can use all the Chrome extensions, themes and so on. Meaning the only criticism really is the lack of ability to remove the Brave shield and the BAT reward symbol/notifications. Then we might have forgiven its take of a bit more nav/tabs space than Safari and may have even tried it as default browser. Meaning this now looks like a very competitive browser with some key benefits, such as speed. Making it a choice on its own, in addition of course to the entire BAT aspect.